"41UR315, Burial 22, Vessel 105" by Timothy K. Perttula and Robert Z. Selden Jr.
DECORATION (INCLUDING MOTIF AND ELEMENTS WHEN APPARENT): The upper panel of the rim is plain, while the lower panel has upper (with their apex pointing towards the carination) and lower (with their apex pointing towards the rim) engraved nested triangles repeated four times around the vessel. The nested triangles are defined by two sets of four diagonally opposed engraved lines, within which is a single triangle with hatched corners and containing a negative oval element. 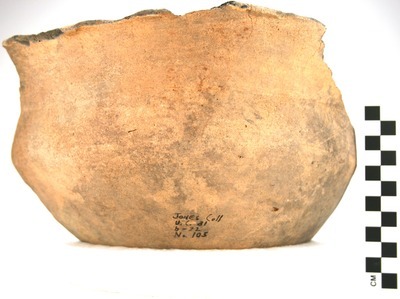 Vessel 105, Burial 22, Ripley Engraved, var. Williams compound bowl.